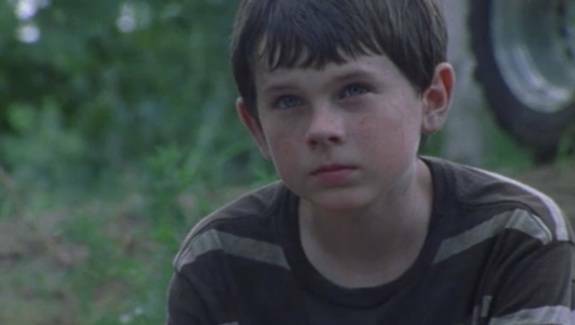 How Old Is Carl Grimes In The Walking Dead? Carl's age on AMC's The Walking Dead has been a topic of conversations for years. The actor burdened with playing the child of the zombie apocalypse started working on the show at the age of 10. Heading into Season 8, Chandler Riggs is 18 years old. Riggs, who graduated high school a few weeks ago, has aged significantly since becoming Carl Grimes. There was never a specific age applied to the character during the show but many assumed he was between the age of 10- and 12-years-old when the series began. Also unaddressed officially is the amount of time which has passed since The Walking Dead began its first episode in 2010. Looking back at the events of the series, though, conclusions can be drawn about how long these characters have been surviving in the apocalypse. Lori Grimes became pregnant in the show's first season and delivered her baby in Season 3. Some time followed her death before Season 3's midseason break. This allows for about a year's worth of time to have passed between the first episode of The Walking Dead and the Season 3 midseason finale. Between Season 3 and Season 4, several months had passed. The prison had been rebuilt in the wake of the Governor's attack and the weeks which followed saw infections and diseases plaguing the group. For this, the estimated total comes up to about 18 months from the show's start. Season 4's second half sees the group scattered and journeying to Terminus. There is no set timeframe for the journey which was told from various perspectives as the groups attempted to reunite but also desperately searched for sanctuary. At most, the search for Terminus took a couple of months but it's hard to imagine the group surviving on the road for this long given their conditions, so the entire journey and the escape from Terminus is being billed as a couple of weeks, instead. After Terminus, the group sets out on the road again. This time, they are lead to Alexandria. The long journey from Atlanta to Virginia falls under the same umbrella as the search for and escape from Terminus, though at one point Rick gives a more specific claim of "It's been three weeks since Atlanta." 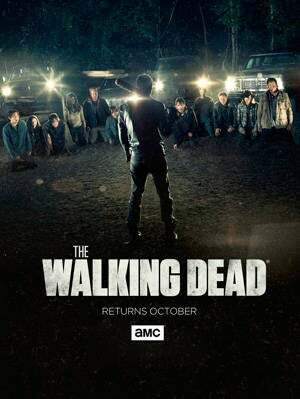 Rounding up, it looks like Season 1 through Season 5 of The Walking Dead took place over the course of two years. Season 6, however, brought a time jump into play which appeared to have aged Baby Judith by about a year and allowed Carl's brutally injured eye socket the proper amount of time to fully heal. By the end of the season, it's safe to safe that another year had passed. This puts us at about three years passing since Episode 1x01 before Season 7 begins. However, Season 7 took place over the course of a month, at most. Scattered storytelling revealed plots happening simultaneously with one another. With an rounded up estimate of 3.5 years passing since The Walking Dead began paired with the 10- to 12-year-old, the assumption is Carl Grimes age sits between the age of 13 and 17 on the AMC series. The Walking Dead comics laid out the timeline trajectory for the TV series, though there are a few deviations. Editor Sean Mackiewicz as weighed in on the topic in the comic's Letter Hacks section. "Rick's age has never been revealed in the comic," Mackiewicz said. "Its true! Enough's revealed that you can figure out he was 23 years old when he started getting serious with Lori... which invalidates your theory because Rick can't have been 27 at the same time Carl was 7." Mackiewicz does, however, admit that there is a bit of in-house debate of Carl's age. "Robert [Kirkman] and I disagree on many things, but maybe none more so than Carl's age," Mackiewicz. "The irony there is that I know Carl is 7, like you all do, because Robert wrote he was 7 in issue 5. So long as Carl never says how old he is post-time jump, you can just ignore what we say in the letter pages as made up s---. (Except for everything I just wrote.)" "It's totally possible that Carl has aged five years since the beginning of the series," The Walking Dead's writer/creator Robert Kirkman concluded. "Kids age fast!"